If Kevin Smith had a three way with Roger Corman and George A. Romero, and birthed a love child, it would be A Plague So Pleasant. This is a truly original idea. Yes it’s about Zombies, which has been kicked to death with no return of originality. But there are the few that stand out. There are the few that do something totally different, and expresses that originality that so many lack. 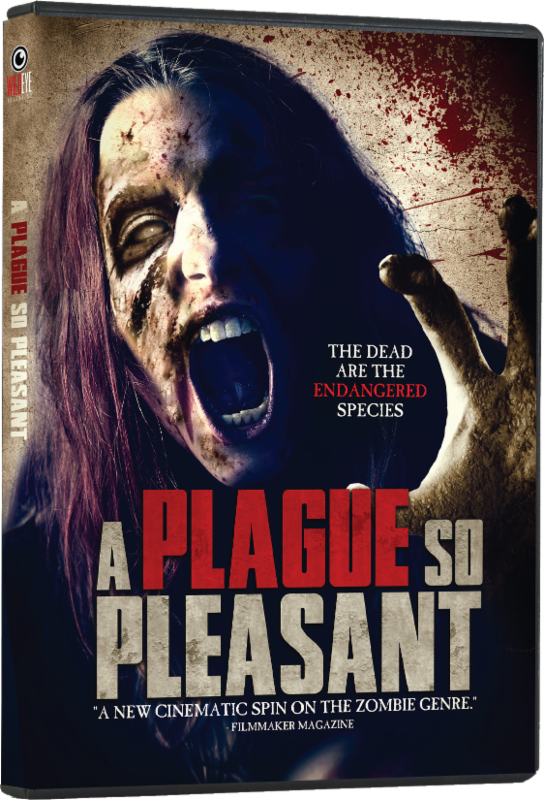 A Plague so Pleasant is one of those that spark an original idea, and a unique approach to the world of Zombies. This half Black and White, and half in Color comedy horror, is a picture that has such a dry humor, that you the viewer, truly are entertained by. I absolutely loved this comedy horror. It was fresh, different, and truly an odd duck in a world of countless repeats. The unique slow burn mentality. The odd camera work. Amazing makeup and effects, which I was floored how excellent this reality was in the picture. The makeup and effects, is what truly adds such great flare to the film. The first half and end half, the black and white filmed moments, is truly my favorite part of the film as a whole. There is a slow burn, dry humor and artistic approach in the film at the start and end. The low down to the plot is. Yes the Zombie Apocalypse happened. A 12 hour Zombie rampage. What they discovered is the Zombies would only become animated, and attacked if fired upon. It you use a weapon they turn into brain eating, fast zombies. So the public, the government put into place that no Zombie could be killed. And so the Zombies just existed without bothering the humans as long as the humans didn’t bother them. Your main character is Clay. His roommate Todd wants to date his sister Mia. But Mia is in love with her dead boyfriend. She can’t let go of him, even though he is dead roaming around the woods. Clay takes it upon himself to kill the boyfriend Zombie. 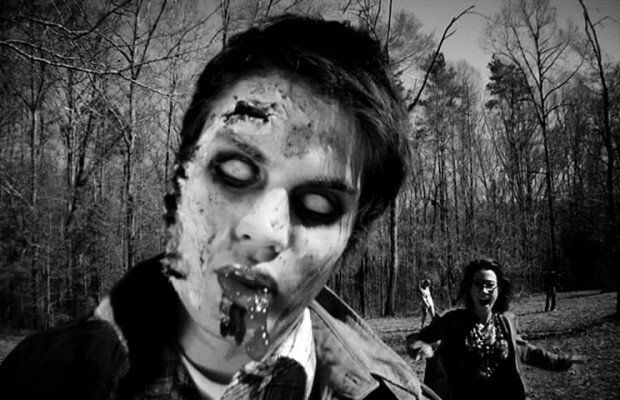 He sneaks out and finds the boyfriend zombie, kills it. Well as you would guess, the bullet awakens the brain eating zombies. No longer are they peaceful, but now ravaging dead once again. All the acting is spot on. The roommate Todd played by Maxwell Moody acts in that Christian Bale, American Psycho tone of conversation and emotions. Moody truly captures the part, and creates a dry humor that you have to see to understand. David Chandler, your main star, and character Clay is also a mix of dry humor, and emotional depression. All the characters come to life in a believable way through the wonderful, odd, over the top at times acting. Each of the characters have their own style that just makes the film, funny, different, and absolutely weird. Eva Boehnke plays Mia. She is fantastic in the part. The chemistry between the actors is like watching a stage play of performers, playing off each other, in odd, weird ways that stand out. Which I might add that this is the first feature length film for all three of them, (at least that is what I can find out). I think more or less they did a great job for a low budget, indie horror, B-movie. The dialogue at times is gut busting. The script is something that makes this film stand out above and beyond all the other rehashed Zombie films. There is a moment where Clay is at his office, during a meeting, when his boss is reading form a pamphlet that I cracked up on. I mean it’s dull and stupid moment, but that was the point. It was like Ben Stein in Ferris Bueller’s Day Off, when he was taking attendance. That is what this movie details, specifically at the start in the Black and White moments. A dry, corny, dull humor that just makes you crack up. Being brought out on DVD by Wild Eye Releasing. Wild Eye did another fantastic, weird and odd choice of film to express. A Plague so Pleasant is a different style of Zombie film. Yes it has the mentality of comedy horror, but it also adds the unique reality of independent film making. This feature is written and co-directed by Benjamin Roberds. Also as co-director Jordan Reyes. This being both there first time in the direction department. This is there first feature length film, and I think with all its odd and screwy reality, it works. I was entertained. I laughed, and felt all the wonderful dry humor. The silliness, and also the homage trademarks to the Zombie Film world. These two directors took the old, tired, I don’t want to hear about zombies again. I could care less mentality, and turned it around for me. I will be very blunt, I hate Zombies. I hate Zombie movies, I hate everything about Zombies this day and age, that is unless we are talking about the original concepts, or horror landmarks like, Night of the Living Dead, Dawn of Dead, and Day of the Dead, Fulci’s Zombie, or anything Fulci, 28 Days Later and so on. The Zombie mentality has been hashed, rehashed and over done to the point they aren’t scary, and to me there utterly boring. Thankfully there are a few writers and directors of films that bleed some new original reality into the dead, (no pun intended) concept. Both Roberds and Reyes are two of those directors that give a new voice to a tired dead reality. Roberds writing created a unique blend of dry, silly comedy, around a world of flesh eating, oatmeal loving Zombies. There’s a moment in the film where Clay is in a rundown building and there is an eyeless Zombie. This moment is awesome. It plays out like all the old westerns. There in a standoff moment. Music, close up of the faces, and hands, as they pause to see which one makes the first movie. A brilliant moment. That is what this film has, many moments that are truly unique and memorable. If I had to pick one flaw, it would be the running time. Only coming in at a little over 75 minutes, it still felt a little long winded, and kind of dragged in small spots. Not a major flaw, but one that could have added a little tighter flow of the film if it had been cut by 5 to 10 minutes. I have to give a huge shout out to Tylar Carver. His make-up special effects is extraordinary and some of the best I have seen in a low budget horror film. He truly captured a unique, yet old school beauty to blood, gore and rot. Amazing shots of pure make-up carnage that stood out. Also I have to give a shout out to one of the directors, Jordan Reyes for the cinematography, pure awesome. I think that is another amazing thing about this low budget horror film, is all the behind the scenes work. The visual effects, sound department, music, makeup, lighting, all works, and in my viewpoint gave an excellent trip of independent horror. Love the song “Oh Freedom” written and recorded by Green Gerry, who also is in the film as himself, a.k.a. Mia’s Zombie Boyfriend (Green Gerry Facebook). The music and sound throughout the film give another good reality to this fascinating trip into low budget, unique comedy horror. Promos, both Domestic and International. Also the disc. comes with many trailers. Ebola Zombies, Blood Soaked, Disco Exorcist, Jonah Lives, and Night of the living Dead: Reanimated, A Zombie Exorcism, Frankenstein’s Hungry Dead. My favorite parts are the black and white moments. For lovers of low budget, independent, B-movies, Drive-In style flare and late night screenings, I feel you will take to this film, and get it. Lovers of Horror Comedy, of Dark Comedy will love this film. This is fun romp, and also a unique B-movie zombie film that stands out from the countless others. A great DVD from Wild Eye Releasing for all the fans that get this style of B-movie entertainment.